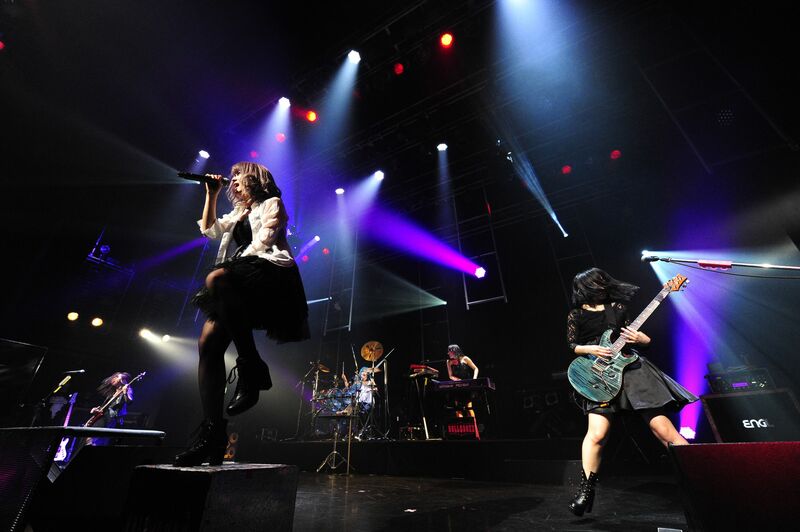 After an almost 3 year hiatus, DOLL$BOXX returned Saturday night to rock Tsutaya O-East. 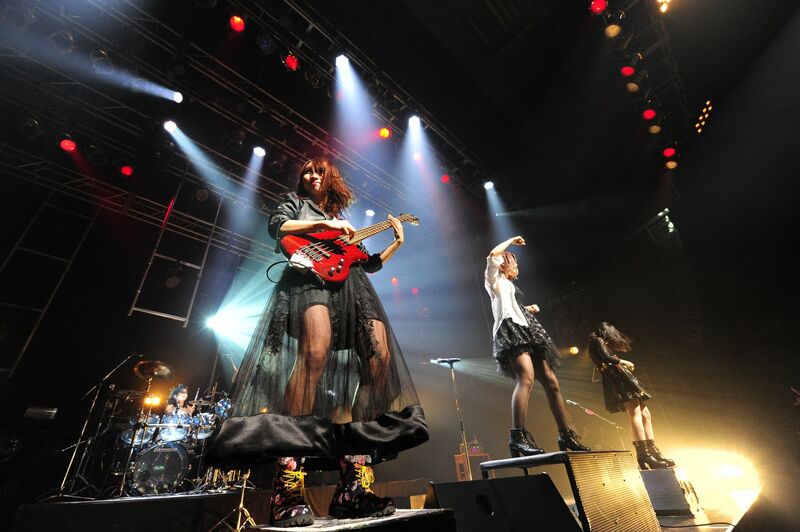 The eagerly anticipated show, which also featured bands Fuki Commune and Gacharic Spin, sold out almost as soon as tickets went on sale. The concert was not only attended by Japanese fans, but also by several fans from abroad who made the trip for this special event. Fuki Commune was the first band to take the stage. They opened with the fast paced “Tsuki Ga Michiru Mae Ni”. In this song Fuki’s vocals featured both her trademark power and cuteness. Next up was the rocker “I’ll never let you down!”, which was filled with operatic growls from Fuki and a blistering keyboard solo from former Light Bringer member Mao. This amped up the excited audience even more. 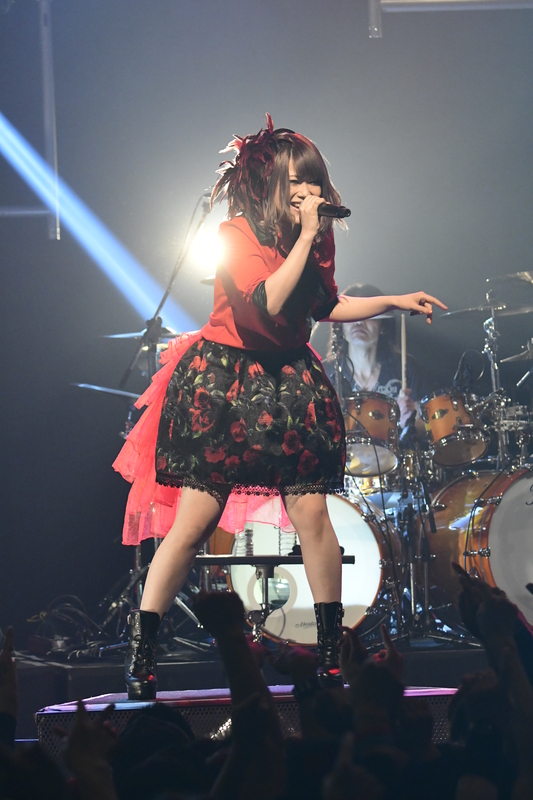 “Roguauto shinaide!”, a new single that will release on March 22nd, was also performed. The band kept the high level of excitement and enthusiasm of the crowd up through the entire 8 song set. They ended their performance with the speed metal track “Sail on my Love”. Next up was Gacharic Spin. The crowd went into full ‘Gacha’ mode, with colored GS wristbands equipped and fists pumping, as the band entered the stage to “GS Gacha”. The band wore their red costumes from KAKUHEN. They kicked things off with the rockers “Sekira Liar” and “Never say never”. Neon lights filled the concert hall next as the band performed “JUICY BEATS”. Oreo once again sang lead vocals on this song instead of Hana, just as she had at their Tokyo Dome City show in November. Fan favorite “Ben-Jan-Dan” was also performed, but with some new choreography and another gag that is hilarious. I am not going to spoil the gag in this review since it is brand new and is best experienced not knowing it in advance. Based on the reaction from the audience I would say that this new element is a success and will be included in future performances. The band closed their 8 song set with “Dangan Beat”, which elicited much excitement, jumping, and a frenzy of waving towels from the audience. 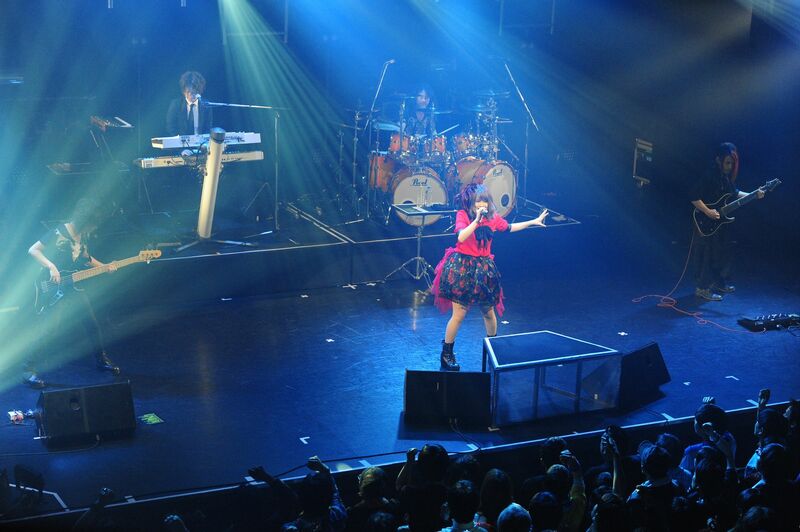 It was time for the final act – DOLL$BOXX. Loud cheers filled the venue as the familiar piano intro to “Loud Twin Stars” began to play. The crowd erupted as the members took to the stage and TOMO-ZO struck the opening chord. It was apparent after the opening song was performed that the band’s hiatus would not effect their performance. The chemistry between Fuki, KOGA, Hana, TOMO-ZO, and Oreo was still there – DOLL$BOXX was back! The set list that the band performed was the first 9 songs from DOLLS APARTMENT in order. The song that probably got the biggest reaction from the crowd was “Take My Chance” – much jumping and headbanging occurred. Other highlights in the set were: the band leading the audience with salutes and marching in place during “Role-playing life”, the band members performing like mannequins in “Omochanoheitai”, and just an all out blistering performance of “Karakuri Town”. Fuki more than matched her powerful soaring vocals on the studio tracks in this live performance. For me this stood out the most in “Fragrance”. All of the band members performed flawlessly. For the encore the band performed the Gacharic Spin / Fuki collaboration “Black Survival”, which had the entire place in a frenzy. It was an absolutely amazing show. At the conclusion of the event Fuki stated that something would be happening in the summer of 2017. What can that mean? We can only hope. 2. I’ll never let you down!